Zhou Guangren was born in Hannover, Germany of Chinese Parents. She began her piano studies in Shanghai with Qian Qi, Ding Shande, Yang Jiaren, Mario Paci, Alfred Marcus and Bela Belai. She subsequently studied at the Central Conservatory of Music with Aram Tatulian from Moscow and became a faculty member of the Piano Department. Her career as a concert pianist started at an early age, when she was invited to play with the Shanghai Municipal Orchestra and later in Beijing with the Central Philharmonic Orchestra and Dresden Symphony Orchestra. She was prize-winner during the Piano Competition of the 3rd World Youth & Students Festival in 1951 and during the 1st Schumann International Piano Competition in 1956 in East Berlin. She was soloist at the Central Philharmonic Orchestra. 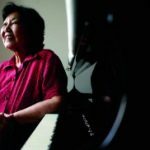 In 1980, she gave recitals in 29 universities within the USA, introducing Chinese piano music. In 1989, she played a recital in East Berlin and in 1995, she played Mozart’s A major Concerto in London. She organized and played Piano Duo Concerts in Mainland China and Hong Kong. Since 1980，she has been a frequently sought after adjudicator in major international piano competitions, such as the VanCliburn, Gina Bachauer, Leeds, Marguerite Long, Tchaikovesky Junior, Rubinstein and in Chile and Norway etc.